All dramatics aside – Post-grad life is rough. We’ve spent our entire lives with knowledge of what society expects us to do next, until college. After Junior High comes High School. After High School, then College. And after College comes ______. For some its to get married, start a family, and work towards being homeowners (definitely not me). For others it’s continuing your education in a master’s program or in law school (no thanks, currently drowning in student loans). For me, I had a nice clean slate. I finally attained my degree in four years – as planned, while working full time at Nordstrom as a Personal Stylist, and had the time of my life. Then in May of 2013 came graduation … and the big girl questions came flying at me. 1. I’m a perfectionist – making me extremely goal-oriented, with a 5 year plan – yup. I’m that girl. I knew I was in love with fashion but didn’t LOVE working in retail. 2. I’m a control freak. Not knowing what was next literally made me sick to my stomach. 3. I’m independent. I absolutely could NOT move home (Northern California) and press pause until my life came together. I had to figure it out on my own. Like most girls, I’ve always followed tons of blogs and articles – comparing my life to every woman that came in my path. It’s natural and I’m not afraid to admit it. I try to control every single situation around me and blame myself if things don’t happen they way I planned or even worse, expected. So with the help of my personal life therapist (my mother) and my incredibly supportive boyfriend, I took a deep breath, re-wrote my resume about 70 times, and started the lovely job hunt. I couldn’t tell you how many jobs I applied to before finding my current position, but I can tell you one thing, It was the hardest summer of my life. Fall gracefully approached, and so did my position at a hybrid publicity/branding and publishing agency. My point is – while I was focusing my energy on not being in the same place as the women at the peak of their careers, I should have been enjoying the experience of finding my voice. I learned so many things about myself that summer, but my greatest take-away was to NEVER compare myself to ANYONE else. As a true Leo – a few of my obvious personality traits are that I’m very stubborn, focused, and passionate. I’ve struggled with learning how to control these traits my entire life, but eventually learned to appreciate and love my persistent features. As a young woman learning more about my mind and soul, I challenge you to only focus on yourself. Write down your goals every week, no matter how big they are. Continue to aspire to be like your role models but never compare your struggle to theirs. God will never put you through anything that you can’t handle. Take control of your goals and chase them, no matter what. 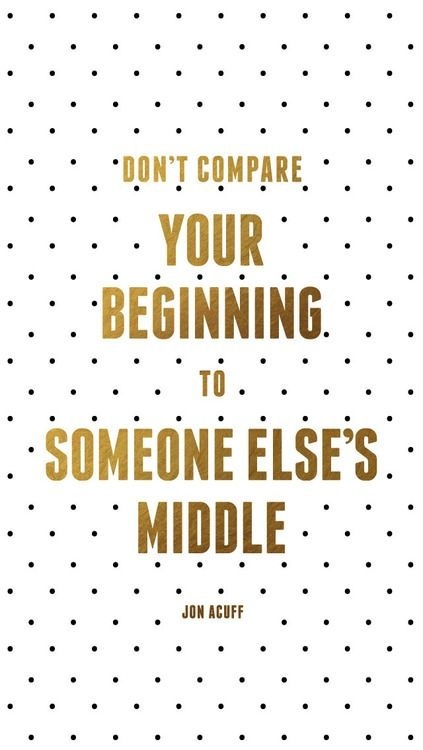 Don’t ever compare your beginning, to someone else’s middle. This entry was posted in Mind and tagged careers, college, life, style, twenties, women on September 5, 2014 by Janay Lampkin. So inspirational. I think it’s one of those mistakes a lot of us make but with the right attitude and drive we can really do anything. Thank you so much Rubi! There is no longer this cookie-cutter outline for people to follow once they graduate school. That “traditional” approach doesn’t necessarily work anymore. It’s so important to find our voice and our calling and just run with it! Who cares what anyone else thinks of our decisions? Keep being you and the world will offer you a life of abundance. Keep it up!